Fruit of Algaia’s research, Satialgine® S 9075 NS allows to create inclusions in the form of pearls of aromas, spices, essential oils and other sensitive health actives. 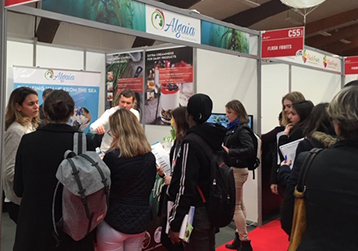 Presented as part of the Espace Tendances – Créations Culinaires, the Algogel® concept for the vegetable sausage envelope brings both a crunchy texture and a protective membrane for products that are even suitable for vegan diets. This two-in-one concept also allows you to texture the inner part of the sausage to obtain a succulent product, consistent and with a lighter labeling. Finally, with good thermostability, the Algogel® range offers a wide variety of cooking options: in boiling water, under the grill or on the barbecue. 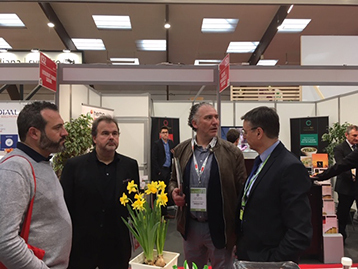 Many other applications were also presented and the team was also honoured to see the internationally-famous French baker Pierre Hermé stop at our stand.